A 68 year old HIV-positive male presented with a herpetic corneal ulcer which was treated unsuccessfully with acyclovir. Acyclovir sensitivity of herpes simplex virus was tested with a dye uptake assay and we found that the herpes simplex virus isolated was resistant to acyclovir. We started eye drop therapy with NGF and the corneal herpetic ulcer healed in 23 treatment days. The case presented here is the first described in the literature in which a herpetic corneal ulcer was successfully treated with NGF. We recommend that trials of NGF therapy in herpetic keratitis should be carried out on a larger number of acyclovir resistant cases. Herpes simplex virus (HSV-1) infections of the eye, and in particular keratitis, are quite frequent in people with acquired immunodeficiency syndrome  and are generally treated with acyclovir. Recently, there has been a progressive increase in the number of cases resistant to acyclovir  due to the development of viral strains resistant to the drug and the appearance of a gene tk mutation . Experimental studies have recently demonstrated that nerve growth factor (NGF) is able to block HSV-1 reactivation  and is also able to repair neurotrophic corneal ulcers . On the basis of this, we decided to use NGF eye drops to treat a corneal herpetic ulcer in an HIV-positive patient, where the herpes simplex virus was resistant to systemic and local acyclovir treatment. 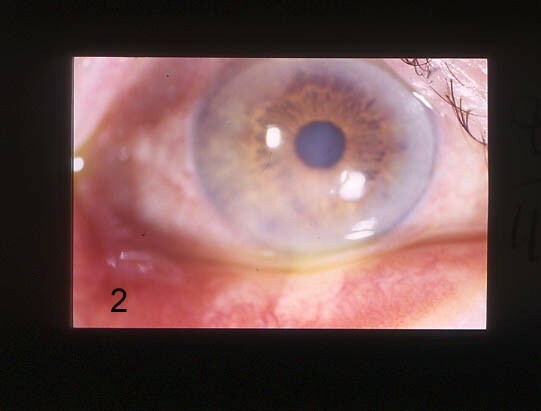 A male patient, aged 68 years, was referred to us in October 2004 with a corneal herpetic ulcer in his right eye. The ulcer had appeared after an influenza vaccination. The anamnesis showed that the patient was HIV-positive without signs of AIDS and with a CD4 count of 496/mm3. Furthermore he was not on Highly Active Anti-Retroviral Treatment (HAART). We treated the patient with oral acyclovir, 800 mg five times daily, and topical acyclovir ointment four times daily. After 10 days of treatment no clinical improvement was observed (Fig. 1). We collected a sample of corneal cells that was found to be positive for HSV-1. The sensitivity of the isolated HSV-1 to acyclovir was tested using a dye uptake assay that measured the quantitative cytopathic effect  and we found that HSV-1 isolates were resistant to acyclovir. 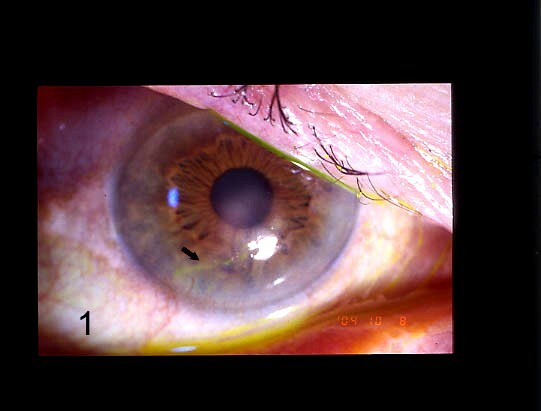 Corneal herpetic ulcer (black arrow) before treatment with nerve growth factor eye drops. On the basis of the persistence of the corneal herpetic ulcer we decided to discontinue the topical and systemic acyclovir therapies and to trial topical treatment with NGF eye drops. Before treatment the patient was informed of the procedures and the aim of the therapy and he signed a written consent form. The institutional ethics committee of the S. Orsola-Malpighi Hospital also approved the study. Treatment consisted of murine NGF purified from sub maxillary glands and produced in the laboratories of the Institute of Neurobiology & Molecular Medicine (CNR-EBR, Roma, Italy). Healing of corneal herpetic ulcer after treatment with nerve growth factor eye drops. This case illustrates the appearance of HSV-1 viral strains resistant to acyclovir . Acyclovir is a potent and highly selective antiviral nucleoside analog, which remains one of the standard treatments of HSV infections in both immunocompetent and immunocompromised hosts. To become active and inhibit viral DNA synthesis acyclovir must be phosphorylated to acyclovir monophosphate by specific HSV-1 thymidine kinases (tk) and then phosphorylated to acyclovir triphosphate, the active form of acyclovir able to inhibit viral DNA-polymerases, by host cell kinases. Previous studies indicate that antiviral resistance develops at a stable low rate in pools of HIV. Acyclovir-resistance is based principally on three different mechanisms . Two mechanisms involve a deficiency of viral tk genes, the third shows drug resistance with normal expression of tk. These mutants have either an altered tk enzyme or a mutation in their DNA polymerase gene . NGF is a member of the neurotrophin gene family which also includes neurotrophin 3 (NT-3), neurotrophin 4/5 (NT-4) and brain-derived neurotrophic factor (BDNF). Neurotrophins exert their biological functions by binding to high affinity transmembranous receptors belonging to the trk family of receptor tyrosin kinase including trkA, trkB and trkC and p75 . TrkA is the receptor of NGF and consists of a 140 KD molecule, which modulates not just neuronal survival but also the migration and proliferation of other cell lines . NGF is a polypeptide that is essential for the survival and growth of sympathetic and sensorial system neurons and for CNS neuronal differentiation . The production of NGF and the ubiquitous presence of its specific receptors have also been demonstrated in the ocular surfaces . The mechanism of action of NGF on the ocular surface to heal corneal neurotrophic ulceration is not well defined. It may be that NGF restores a deficit of synthesis or release of endogenous NGF . A direct mechanism may involve the sensory innervation and the proliferation and differentiation of epithelial cells . An indirect mechanism could be related to the increase of those neuropeptides that promote epithelial healing or the release of cytokines. In vitro and in vivo studies  have shown how the depletion of NGF causes a reactivation of HSV-1. This reactivation is the consequence of the loss of balance between the cytokine produced by the corneal epithelial inflammation and the resulting reduction in the NGF-trkA complex signals . Topical administration of NGF has therefore a mainly anti-inflammatory effect blocking the action of the cytokine and restoring the normal transmission of the NGF-trkA complex towards the nerve endings . The case presented here is the first described in the medical literature in which a corneal herpetic ulcer, resistant to antiviral therapy, was treated with NGF. Although the use of NGF for the treatment of this type of disorder is still under debate, we believe that its use in selected cases of herpetic keratitis resistant to acyclovir therapy must be investigated on a larger number of cases to confirm our result. Mauro Cellini, MD (Department of Surgery and Transplant – Ophthalmology Service) examined the patient and received the informed written consent from the patientfor publication of the manuscript and any accompanying images. We thank Dr. Luigi Aloe (Institute of Neurobiology & Molecular Medicine CNR-EBR, Roma, Italy) for the supply of nerve growth factor for this study. Mauro Cellini, MD recruited the patient from the Cornea Disease Service of the S. Orsola-Malpighi Hospital; he drafted the manuscript and reviewed the literature. Prof. Emilio Campos examined the patient in the time. Pietro Leonetti reviewed the manuscript.